The brent goose (Branta bernicla) aka brant belongs to the family of duck, swan and goose, the Anatidae. 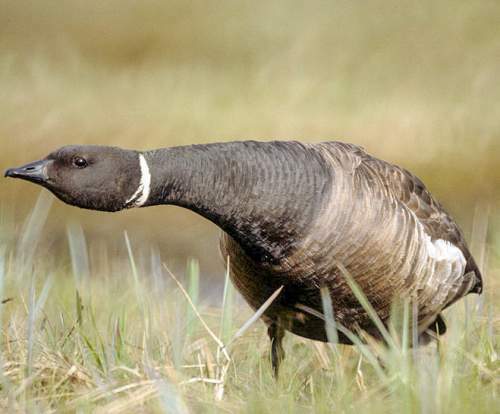 The brent goose is distributed in North America, Europe and Asia. The brant species is fully migratory. This goose species is polytypic, comprising four recognized subspecies. The brent goose (Branta bernicla) is a small goose, measuring 55 to 65 cm in length and weighing 850 to 1800 grams. The males are slightly larger. These goose species have black, gray, grayish brown and white plumage. There is variations in plumage color among the races. The head, neck, back and tail are black or blackish brown. There are black forms and dark-bellied and pale-bellied forms. There are ring-like white patches on the neck. The undertail is white. The bill is duck-like and black. The legs and feet are blackish gray. The irises are dark. There is a dark eye-ring. The call is a loud "quank" or "quak" sound. The breeding populations of the brent goose species are distributed in Arctic North America, Arctic European islands and Arctic Asia. The wintering populations are distributed in west and east coast of North America, west coast of Europe, eastern coast of China, North Korea, South Korea and Japan. 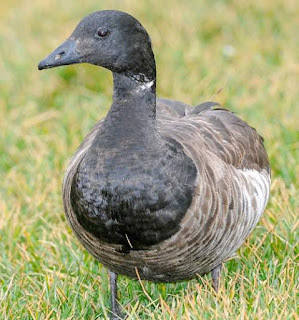 Several Important Bird and Biodiversity Areas (IBA) of these brent goose species have been notified in several countries, viz., Canada, USA, Mexico, United Kingdom, Ireland, France, Norway, Sweden, Netherlands, Russia and Japan. The brent goose species do not occur in forests. They normally occur in altitudes between 0 to 100 meters. The artificial ecosystems include pasturelands and coastal agricultural fields. The natural ecosystems and habitats of the goose species include Arctic tundra, Arctic coastlines, tundra grasslands, estuaries, mudflats, saltmarshes, shallow seas with emergent seaweeds and eel-grass. The diet of the brent goose species consists mainly of plant matter. Seaweeds, macroalgae, eelgrass, sea lettuce, arrow-grass, terrestrial grasses, mosses, lichens and cereal crops are their primary food. These goose species are also known to feed on insects and aquatic invertebrates like, snails, amphipods, fish-eggs and marine worms. The breeding season of these brent goose species is during June in most of their breeding range. They are monogamous and breed as single pairs or in small, loose colonies. They synchronize egg-laying period. The breeding ecosystem includes coastal Arctic tundra, Arctic grassy islands and icy tundra. The nest is a bowl-like shallow depression on elevated ground, often lined with grass and down feathers. The clutch may contain three to five off-white colored oval eggs. The female incubates the eggs. The male remains close and guards the nest. The chicks hatch out after 24 to 26 days of incubation. The hatchlings are precocial, able to feed themselves almost immediately. The young birds fledge after six weeks. The brent goose species are fully migratory birds. They breed in Arctic North America and Arctic Asia. They migrate southwards during September and arrive at the wintering grounds in late September and October. These goose species winter in west and east coast of North America, west coast of Europe and the eastern coast of China, North Korea, South Korea and Japan. The return migration to the Arctic breeding grounds occurs in early summer, from mid-March to mid-April (Madge and Burn 1988). The global population size of the brent goose (Branta bernicla) is estimated to number about 560,000 to 650,000 individual birds (Wetlands International 2015). The overall population trend of the species is unknown. In most of its range, this goose species is reported to be uncommon to fairly common. The generation length is 10.9 years. Its distribution size is about 22,100,000 sq.km. Ecosystem degradation, ecosystem conversion, adverse weather, climate change, hunting for food, sport hunting and capture of adults and juveniles for pet-trade are the main threats that may endanger the survival of the species. The brent goose (Branta bernicla) species does not approach the thresholds for being Vulnerable either under the range size criterion or under the population trend criterion or under the population size criterion. 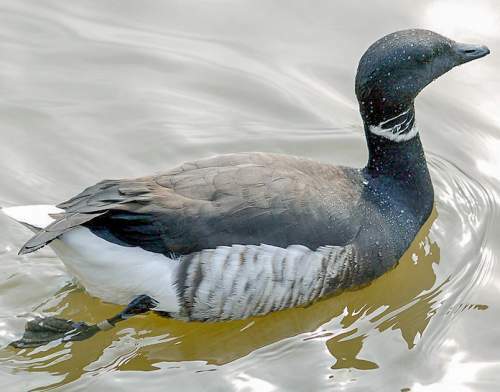 The CITES (Convention on International Trade in Endangered Species of Wild Fauna and Flora) status is ‘Not Evaluated’ for the brent goose (Branta bernicla). The brent goose (Branta bernicla) is known to hybridize with red-breasted goose (Branta ruficollis). B. b. orientalis Tugarinov, 1941. Recently updated and current topic in Bird World: Brent goose - Branta bernicla.